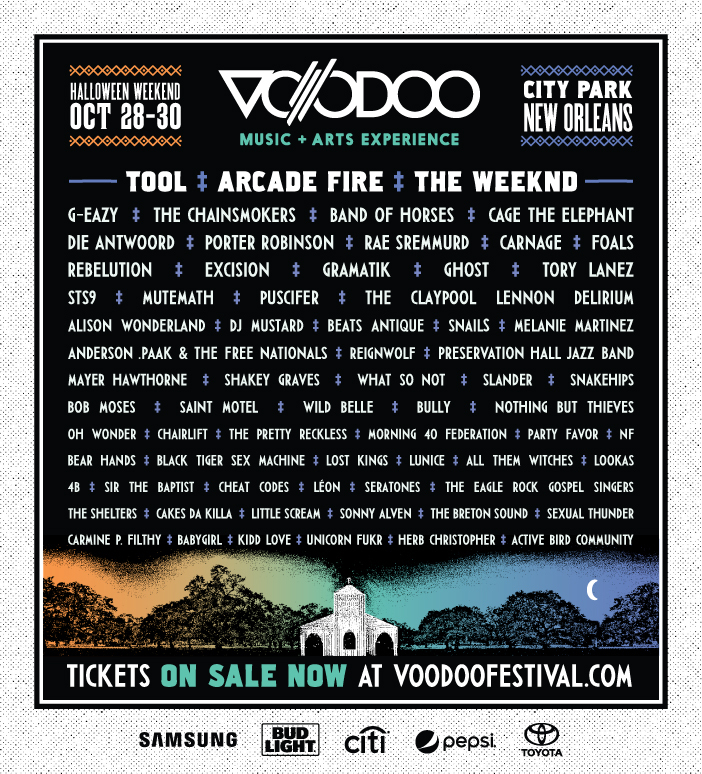 Voodoo Music + Arts Experience 2016 is well underway and for those of you who are en route to New Orleans, make sure to plan your festival day accordingly so you can catch all the festival happenings. The festival has a mix of artists that continues to draw in a huge crowd year after year. There isn’t a genre that goes untouched at this festival. From bluegrass and gospel groups to EDM, rappers, indie rock icons and much more, Voodoo Music + Arts Experience covers a variety of different genres and sound, making it one hell of an experience. The festival has seen about one million music festival goers and a multitude of different artists since its start in 2000. Voodoo Music + Arts Experience continues to do a great job of not only bringing big named headliners to the festival but also doesn’t forget to highlight a number of up-and-comers as well. Voodoo Music + Arts Experience happens every Halloween weekend which helps everyone start their Halloween celebrations off on a high note (music pun intended). The festival has received a tremendous amount of attention, even on an international scale. Festival goers from all over flock to the historic city of New Orleans just to enjoy a unique musical atmosphere that happens every year in the end of October. Check out the lineup below and if you aren’t there now then I’m sure as hell know you’re going to be there next year- just look at this lineup!